If I recall correctly I didn't even plan on going to this show. I'd seen Motörhead a bunch of times before and thought that they were great every time but I was just going to skip it. I lived near the Ogden at the time and when I got home that night I just figured why the hell not. Great loud show. Didn't have high hopes for the recording while I was watching the show. It was stupid loud. Despite that I think it turned out really nice. What a better way to spend Easter Sunday. Coming straight outta Ft Collins Colorado. 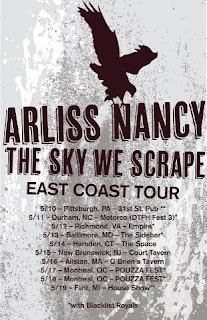 Arliss Nancy!!! They have slowly but surely become one of my very favorite bands. Kind of in the vein of Lucero, Drag The River, Gaslight Anthem and that ilk. The are just about to go out to the East coast for some shows. Check them out if you get a chance. This here is a set from when the play a Suburban Home Records anniversary party back in 2011. Really nice matrix recording. I sat on this for awhile because at the time the played a bunch of new songs. All those songs have since come out on their album Simple Machines. Enjoy. Clutch has a great new album out called Earth Rocker. Hearing it and missing their performance down in Colorado Springs got me thinking about times that I had seen them in the past. This show was an 'evening with' show were Clutch played two sets. This tour was for their amazing release Blast Tyrant. The setlist is chalk full of classic Clutch tunes and a couple instrumental jams that are pretty interesting. Check it out and if you have never seen Clutch live do yourself a favor and catch them the next time they stop through your town. This was back at the end of the CDR trading days and the beginning of the torrent era. I'm pretty sure I traded this out a bit and most likely posted it somewhere. This version is a fresh transfer and new mastering job on the original recording. Consider it an upgrade is you have this already. What a fun live band Larry and His Flask are. Just high energy right out of the gate. This was my first time seeing them after hearing rave reviews from my friends about a show I missed. I was not disappointed and I've tried to make it a point to catch them anytime that they come back. Hope you enjoy.